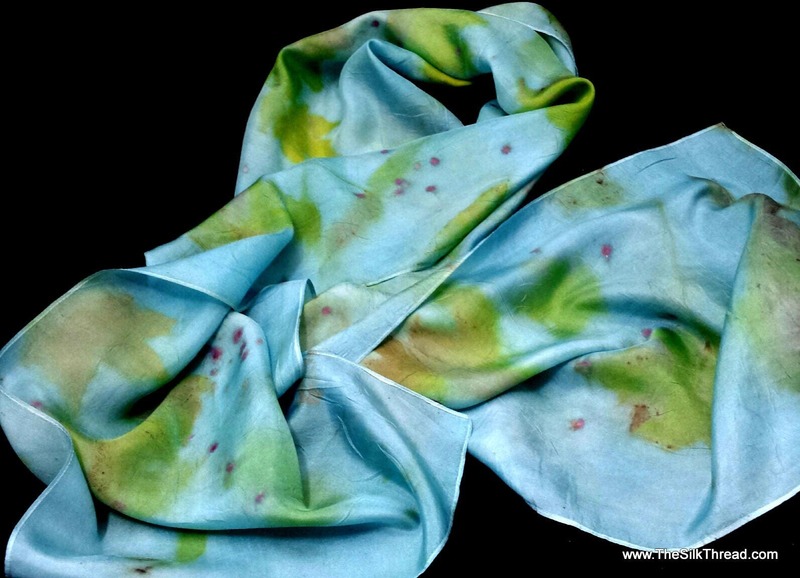 My beautiful seagreen eco-printed or botanically printed, one of a kind silk scarf has a llovely soft design from maples, sumac berries and jonquil blossoms! The beautiful combination of the natural colors of the maples and sumac with yellow from jonquils is enhanced with indigo. That combination transformed the yellows into popping greens with an overall seagreen/ seafoam color. The scarf is LARGE! It is a generous 14" x 72" pure silk making it suitable for a hajib or light wrap My all natural technique creates detailed shapes and colors of the actual plant matter that I use. A unique and unusual gift! Totally sustainable, renewable and eco-friendly art form. Each scarf is assigned a number to help in any discussions 🙂 Colors may vary on different monitors.